Follow our complete, step-by-step, photo illustrated instructions to learn how to make this delicious Roasted Pork Tenderloin recipe. We’ll even throw in some fresh apples and onions to add another layer of flavor. It’s quick, it’s easy, it’s super delicious. Printable recipe included. 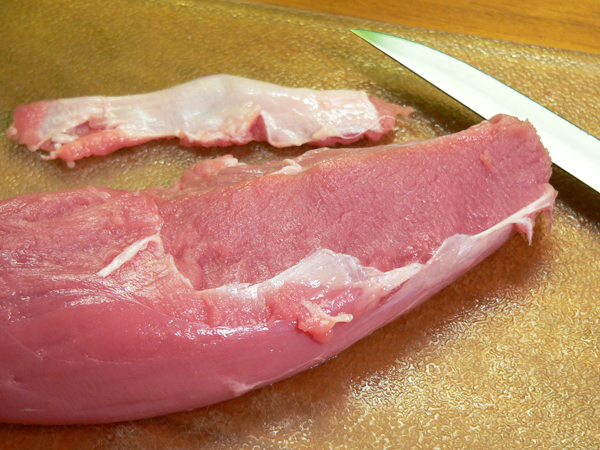 Pork Tenderloin is an excellent cut of meat… as long as it’s cooked right. Overcook it and you pretty much ruin it. It gets all dried out and chewy with very little flavor if you do it injustice while cooking it. It is however, one of my most favorite pieces of pork. I love a homemade buttermilk biscuit with a piece of fried pork tenderloin in it. I hope to have a recipe for that here on Taste of Southern, so you might want to look for it. I don’t have it ready just yet. The tenderloin should not be confused with a pork loin however. They are two entirely different cuts of the pig. Tenderloins are often sold as a pre-marinated tenderloin in various flavors, or you’ll find them packed two per package in a plastic cry-o-vac type of package. That’s what we are using here. Whenever my older brother cooks a pig for a pig picking, the tenderloin is the piece of meat that I start looking for once he starts to chop up the barbecue. Because it’s situated higher on the back of the pig, it doesn’t get exercised much at all, thus it’s super tender. Again, if it’s cooked right. I’m not trying to discourage you from trying to cook one. I just want you to be careful when roasting it so that you don’t overcook it. A good digital thermometer can help with that. Today however, we’re roasting this pork tenderloin in the oven. It’s pretty easy, and well worth the trouble of keeping an eye on the thermometer so it doesn’t overcook. Toss in the apples and onions, and were talking a very tasty supper. 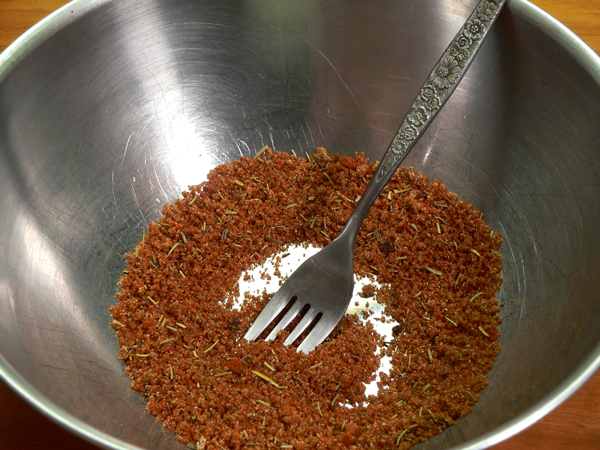 I adapted this recipe from one on the McCormick Seasonings website. Naturally they use all of their own spice brands, but since I didn’t have them all, I’ve adapted it with what I had on hand. Smile. Ready to give it a try? Alright then, let’s head to the kitchen, and… Let’s Get Cooking! 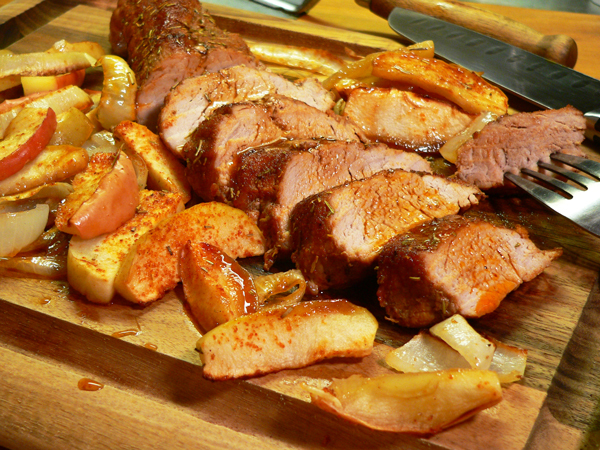 Easy Roasted Pork Tenderloin with Apples recipe: You’ll need these ingredients. Just to be clear, this is a “Tenderloin” and not a “Pork Loin.” There is a difference. You will probably find tenderloins packaged two per pack. Each tenderloin will weigh just about one pound each whereas a pork loin will weigh several pounds a piece. While both are great pieces of pork to cook with, I just wanted you to be aware of the difference. 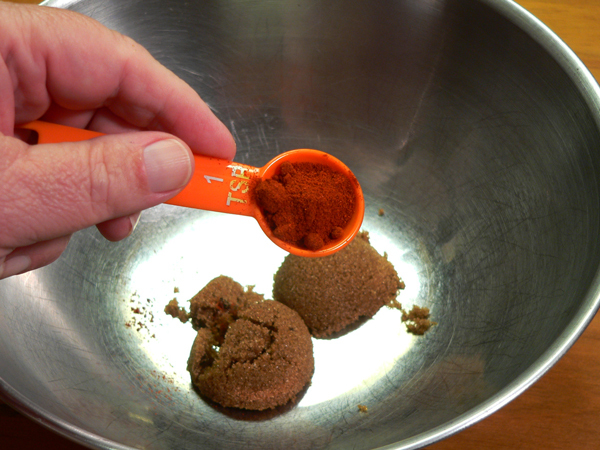 If you don’t have the smoked paprika, you can easily substitute with a regular paprika. 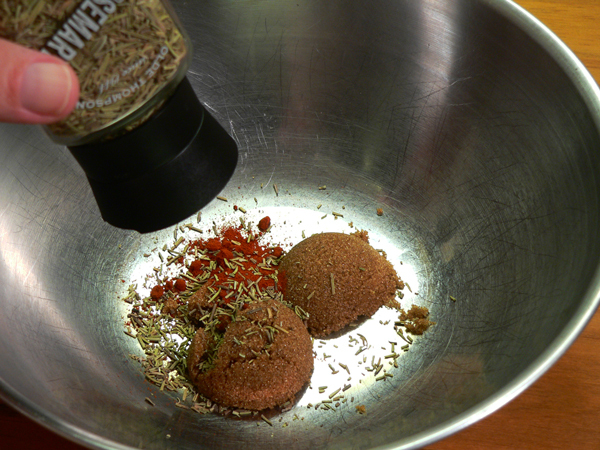 Grab a fork and mix all the spices together. Set aside for now. Wash the apples. Set them aside for now. Rinse the tenderloins under cool running water. Carefully remove the thin silver skin with a sharp knife. You’ll be able to see this easily. It’s just a very thin skin like layer that you need to remove. Slip the point of your knife under one end of the skin, then slide the blade underneath the silver skin, carefully removing it without cutting away too much of the tenderloin itself. This is best done on a dry cutting board by the way. You will also notice a thicker piece of tissue, called “sinew” at one end of the tenderloin. This also needs to be removed. If you leave it on, it will shrink once it cooks and cause the tenderloin to shrivel up a bit. It’s also tough and hard to chew, so carefully remove it with a sharp knife. Same as above, slip the point of the knife under one end of the sinew, then with the knife blade pushing away from you, cut away as much of this thick tissue as you can. I removed the biggest part of it from this tenderloin. 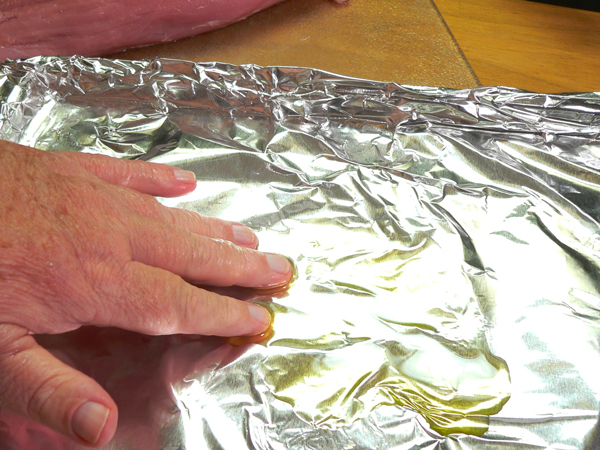 Line a sheet pan with some aluminum foil. Then, add one Tablespoon of the olive oil to the pan. 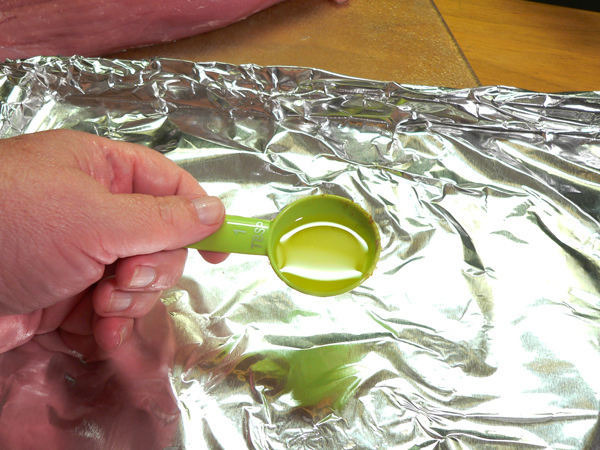 Use your fingers, or a paper towel, and spread the olive oil all over the foil lined pan. 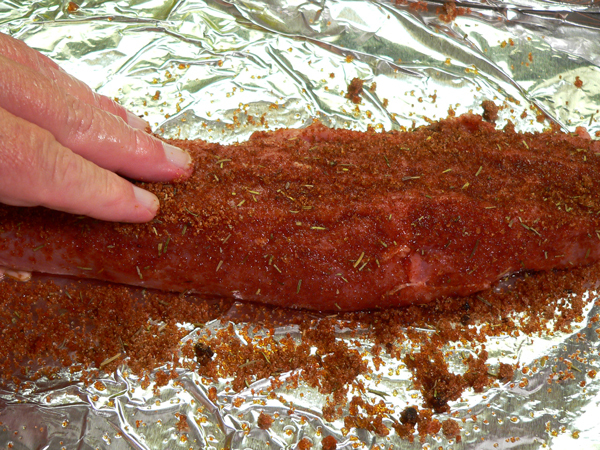 Place the tenderloin on the foil, then roll it around a bit to coat the meat with a bit of the olive oil. Add a bit more oil if you need it. You’ve probably noticed that one end of the tenderloin is thinner than the other. In order to get it to cook more evenly just tuck a bit of the smaller end under itself so it’s as thick as the rest of the tenderloin. You could tie this if needed, but it will pretty much stay in place while the meat is roasting in the oven. Core the apple and then slice it into wedges. You don’t want to be too thin, or too big. Just slice them up as evenly as you can so they will cook evenly once they are in the oven. 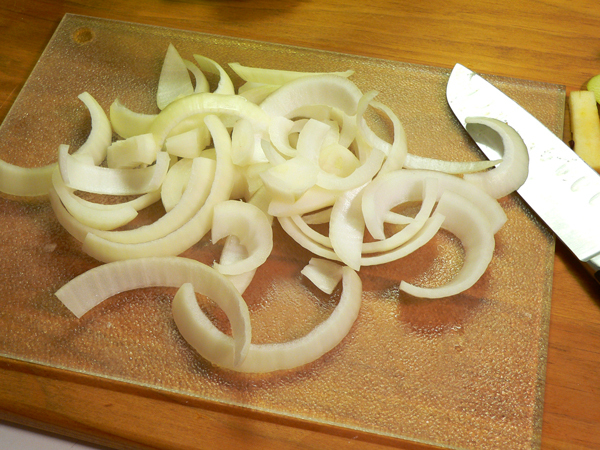 Slice up the onion into larger pieces. If you slice the onion very thin, it will burn too easily once it’s in the oven, so be brave with these. 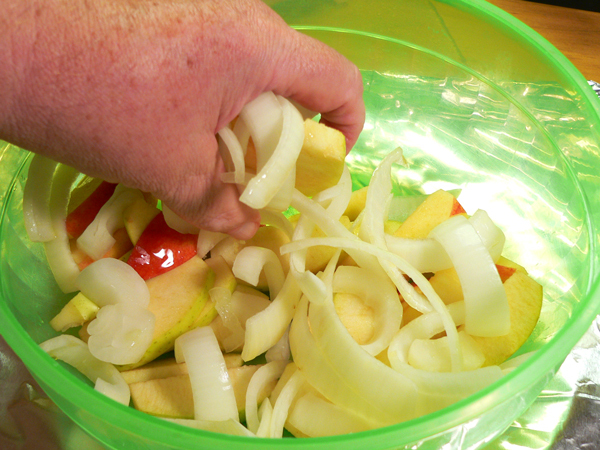 Place the apples and the onions into a large mixing bowl. Then, add the other Tablespoon of olive oil. 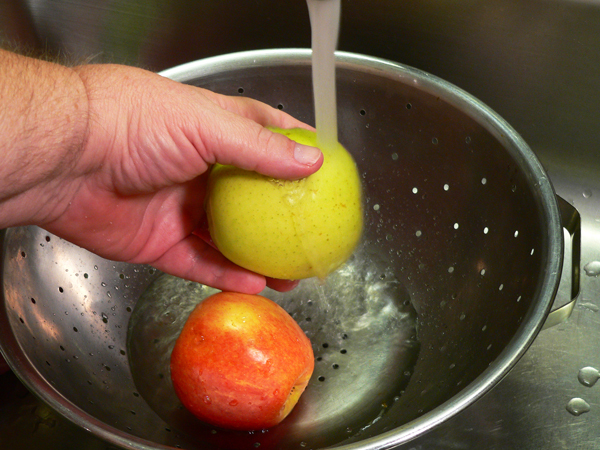 Use your hands to toss the apple and onions together in the olive oil. Try to be sure it’s all coated good. You could even add a bit more olive oil here if you think it needs it. 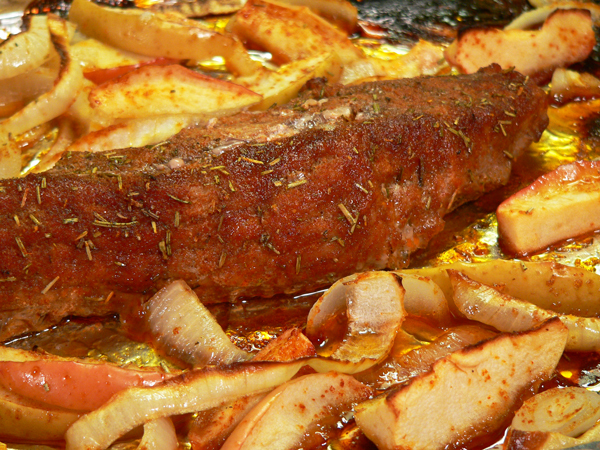 Place the tenderloin in the center of the pan, then spread the apples and onions around it. 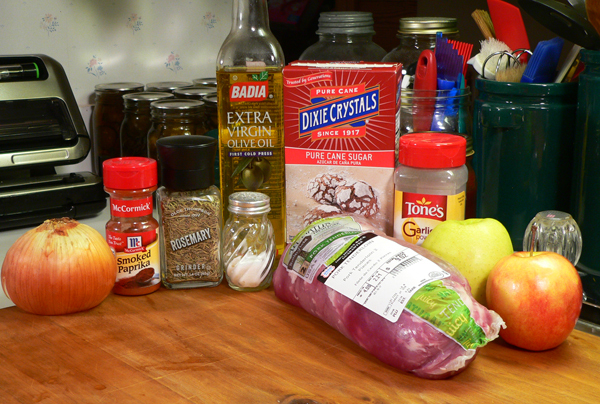 If you have any spice mixture leftover, you could even sprinkle it on the apples and onions. In case you’re wondering, I’m only using one tenderloin in this recipe because I have plans for the other one. If you cook both tenderloins, you might want to add some more apples and onions to the recipe as well. They will shrink once they’re in the oven, and you would probably like to have more to offer as a side. Just saying. Place the pan in the preheated oven. Let it cook at 425F degrees for about 15 to 20 minutes, or until the tenderloin is done and tender. Pork is considered done at 145F degrees. I let this one cook a bit longer, but you really need to keep a close eye on it so it doesn’t overcook. Even by pulling it out of the oven at 157F degrees the temperature will rise a bit and continue to cook before it all starts to cool down. Do Not Overcook. 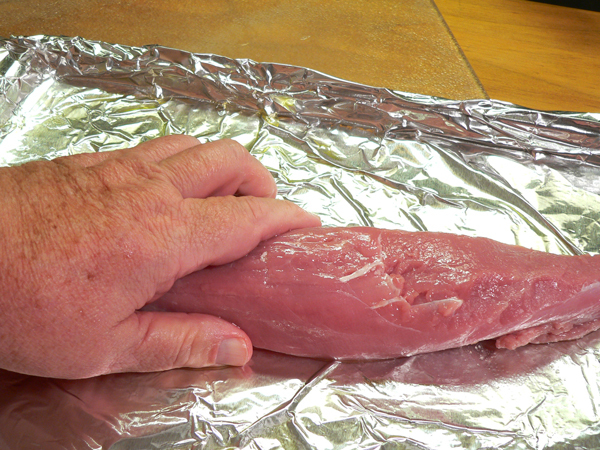 Let the tenderloin rest for 10 minutes before you attempt to slice it. Letting it rest will allow the juices to redistribute throughout the meat, making for a moist piece of tenderloin. 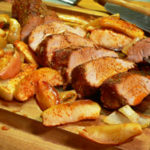 Follow our complete, step-by-step, photo illustrated instructions to learn how to make this delicious Roasted Pork Tenderloin recipe. We’ll even throw in some fresh apples and onions to add another layer of flavor. It’s quick, it’s easy, it’s super delicious. 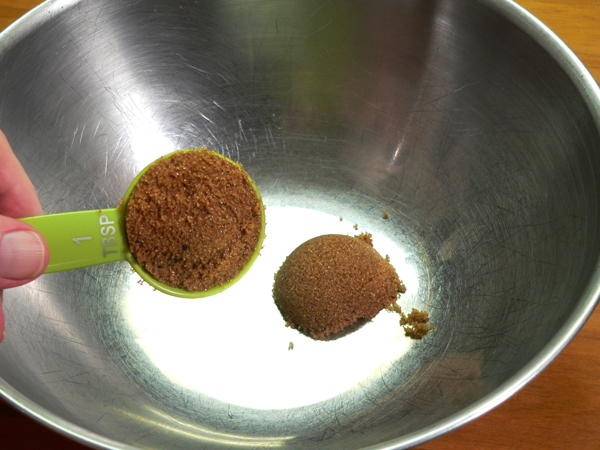 In a large mixing bowl, add the brown sugar. 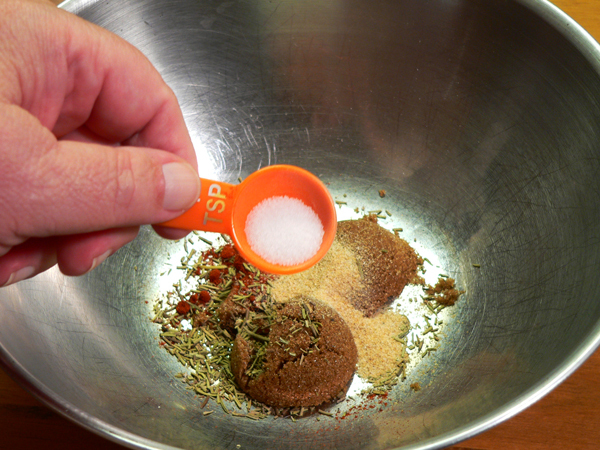 Mix dry ingredients well. Set aside. 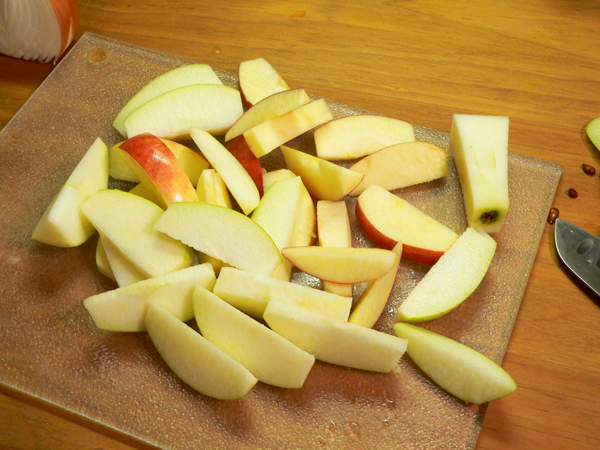 Wash the apples then pat dry with a paper towel. Rinse the tenderloin under cool running water. 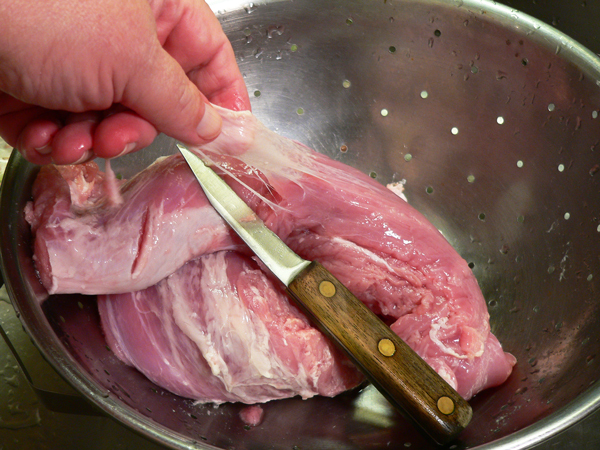 Remove any silver skin, sinew or fat as needed. Pat dry. Add one Tablespoon of olive oil to the sheet pan, spread over pan. Brush the tenderloin in olive oil. 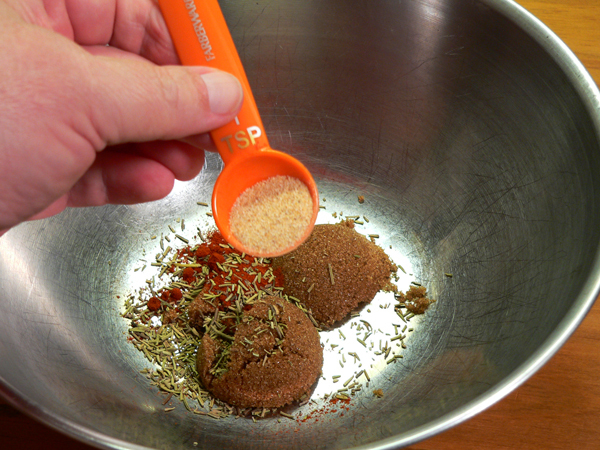 Spread the spice mixture over the tenderloin. Slice the onion into large slices. 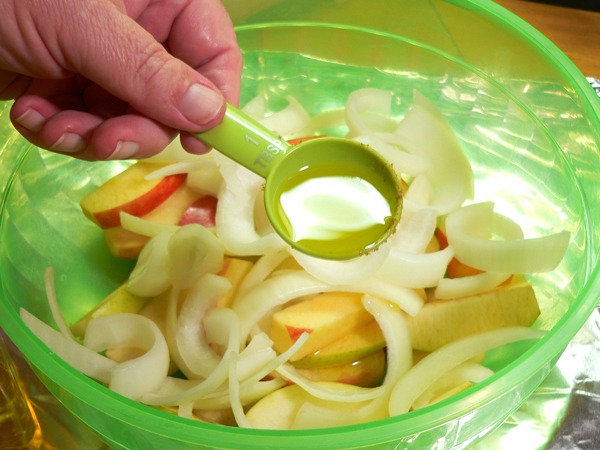 Place apples and onions in a mixing bowl. Coat with olive oil. 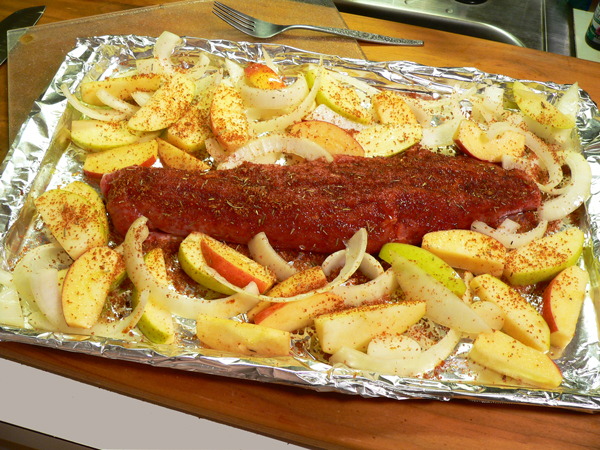 Place the apple slices, onion slices and tenderloin on the baking sheet. Place pan in oven. 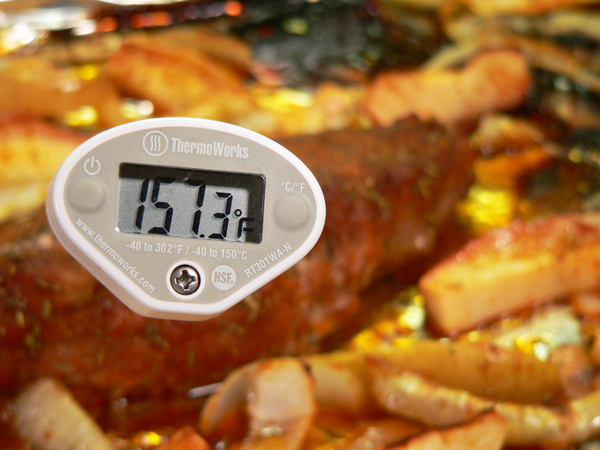 Roast 15 – 20 minutes, or until internal temp reaches at least 145F degrees. Slice tenderloin, serve with apple and onions. Your Comments: Have you ever cooked a tenderloin before? I’d love to hear your thoughts on our recipe. It will only take a minute or two for you to leave your comments in the section below. Another lights out recipe my friend! Thank you again. I doubled the dry ingredients, apples and onions for two tenderloins. When I make it again, I plan to use half of the rosemary. It was a bit much for my tastes. I will also slice the apples thinner and the onions thicker. Re: your wonderful roast pork tenderloin recipe. Well, credit where credit is due Steve, thanks for a very easy, and extremely tasty recipe! Enjoyed this tonight, exactly as you posted it. Couldn’t have asked for a more tender and juicy piece of pork. The apples and onions complimented it very well and for a cold, dismal, rainy night in New Westminster British Columbia Canada, I could not have asked for anything that was more delicious and comforting. Thank you Sir! As you would say, Be Blessed! Keep up the good work, I look forward to your e-mail every week, no matter WHAT day it arrives! I have tried cooking a pork tenderloin several times. They turned out dry and tough except for one I cooked in crockpot with cranberry sauce. My daughter says she makes a stuffing and ties them together. But, she is much better at culinary expertise than I am. I enjoyed your newsletter today and am thankful you had a safe trip home.